Bison bulls graze in the shadows of the glowing peaks of Badlands National Park. Located in southwestern South Dakota, Badlands National Park consists of nearly 244,000 acres of sharply eroded buttes, peaks and spires intertwined with the largest, publicly protected mixed grass prairie in the United States. With over 64,000 acres of officially designated wilderness, the Badlands are home to mule deer, swift fox, bighorn sheep and pronghorn and over 200 species of birds. Native to the Badlands, bison, who were gone from this area by the 1880s, were reintroduced in 1963. The park is also the site of the reintroduction of the black-footed ferret, the most endangered land mammal in North America. 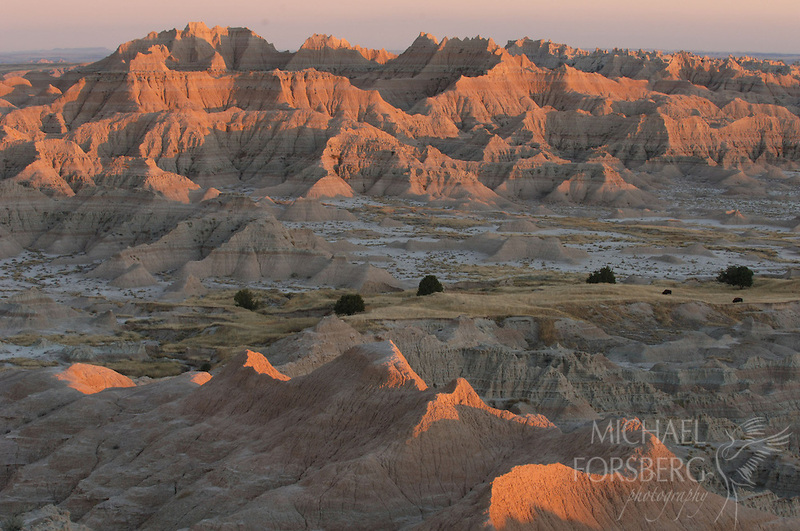 Authorized as a national monument in 1929, Badlands was redesignated as a national park in 1978. Badlands National Park, South Dakota.